Meghan Markle’s engagement is #BlackGirlMagic. While there are some who are out there questioning black America’s “Princess Meghan,” I most certainly was not and will not ever be one of them. After all, if Harry isn’t shying away from acknowledging and protecting Meghan’s blackness, why should we? As one who’s admittedly had a lifelong fascination with the royals, I’d officially gone on royal-wedding watch the day Markle’s body double on the hit TV show Suits let the cat out of the bag. She had bid farewell to the future royal, aka Rachel Zane, in an Instagram post a few weeks ago, complete with the “Cheers” emoji. Markle, our favorite cousin, was moving to London, and I’d taken to Facebook for the engagement countdown, complete with #HarrysMarryingASista and #HerMamaHasLocs hashtags. Markle is one of us, and for that we celebrate. She has been vocal about the racial experiences that shaped her; she’s been open about the “countless black jokes” told in her presence and about the n-word being hurled at her undeniably black mother, who lived in South Central Los Angeles. Hell, she even penned an essay in honor of Martin Luther King Jr. Day on her former blog The Tig. 1. When will they marry? Markle moved to London earlier this month on a fiance visa, which is only valid for six months. Although she is marrying a royal, there are no special exceptions for the couple, who must follow the same rules as all British citizens. A six-month deadline means that they must marry by mid-May. Their courtship has been on a rapid trajectory since their first meeting in July 2016, which could have hastened their marriage, but Harry has chosen to give deference to the birth of Prince William and sister-in-law Kate’s third baby, which is due in April. It was just announced that the couple will marry in May, which is a lovely month for a wedding! 2. Where will they marry? Harry, like William, is permitted to wed in Westminster Abbey, but unlike with William’s wedding, it is not required. Harry is actually free to marry wherever he wants. Although more unconventional, Harry couldn’t deny the world of all the royal pomp and circumstance of a royal wedding (thank GOD! ), so they have opted for a ceremony at Windsor Palace, a bit more low-key than Westminster Abbey. Windsor Palace has hosted several royal weddings, but because the couple shares an affinity for Botswana, part of me was hoping that they would get married in Mama Africa. But a safari somewhere in the Motherland for the honeymoon sounds hella cool. 3. Will the wedding be televised? Markle already had legions of fans and is now one of the most Googled women in the world. 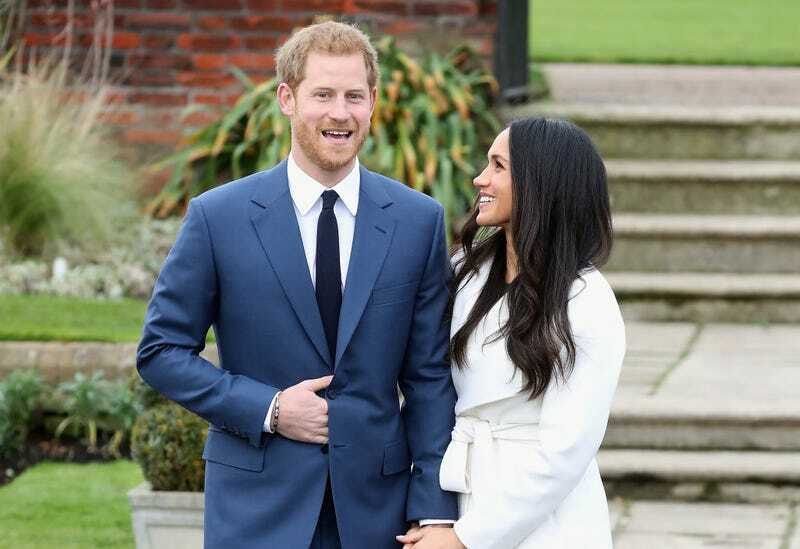 And half the free world has been waiting with bated breath for this ginger-haired royal cutie to settle down, so I’m praying (for real) that we get it on every network (each has a different camera angle). If not, at least give us Facebook Live. 4. Will Markle be a princess? In spite of all the #BlackPrincess hashtags circulating on social media, don’t look for her to be called Princess Meghan. To obtain the title of princess, you have to be born into royalty. In spite of all the confusion, Diana was not a princess; she was officially “Her Royal Highness, Diana, Princess of Wales,” never Princess Diana. It’s too much royal history to go into, but suffice it to say that Queen Elizabeth will most likely bestow a duchess title upon Markle, just as she did with Kate, who is now known as “Catherine, the Duchess of Cambridge.” The title of duke and duchess of Sussex has been available for over a century, so royal watchers are banking on that. 5. And what about the dress? Because her Suits character is always highly styled, Markle has given the media a lot of insight into her personal style. In June 2016, Markle told Glamour that she preferred “wedding dresses that are whimsical or subtly romantic.” In that same interview, she declared that Caroyln Bessette Kennedy’s wedding gown was “everything goals.” So I’m guessing it will be a tastefully fitted yet simple sheath dress and a veil with a long, elegant train. The couple said in their official engagement that they are hoping to start a family “soon.” Although they clarified that they aren’t expecting now, I can’t wait to see some little brown babies running around Kensington Palace. Acceptance and prayer: A list about a black woman’s future with a royal penned by a black woman wouldn’t be complete without asking for prayer and acceptance for our girl. Harry has always been the rebel of the bunch and beloved by all. So I’m praying (as we all should) that his love for Meghan and his fierce protection of and devotion to her will be enough to silence the trolls and foster acceptance of her and #AllLove because truly, that’s what the world needs more of. Lisa Bonner is a veteran entertainment lawyer licensed to practice in New York and California. Lisa writes extensively on legal, op-ed, travel and pop culture for various publications and is anxiously awaiting May 2018 so that she can host her second Royal Wedding Watch Party! Follow her on Twitter.